Host a murder mystery party in NY! 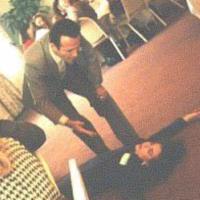 Every party guest can get in on the action, from young to old - it's like being in a real-life murder mystery movie! Find top-notch NY murder mystery party theaters and companies that run murder mystery parties in NY here! KidsParties.Party also lists interactive murder mystery parties in New York will entertain your guests as they try to figure out "whodunit." They Will Come to You in Bronx! A hilarious and entertaining murder mystery party company in NY, THEY Improv is perfect for kids and adults alike. They will come to you if you are located anywhere in the five boroughs of New York. Whether it's at your home or at a theater, THEY Improv is happy to accommodate to your party needs. A variety of services are offered, including murder mystery private parties, murder mystery dinners, and murder mystery game shows. If you're looking for a company to bring endless laughs and entertainment to your kid's birthday party, then contact THEY Improv today! Murder Mystery Parties at your location! 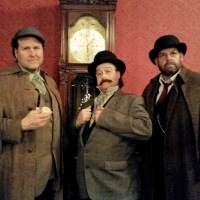 Riddlesbrood Touring Murder Mystery Company brings the show to your location. Their traveling entertainers specialize in murder mysteries, dinner theatre, game shows, corporate parties, fundraisers, childrens birthday parties and more! 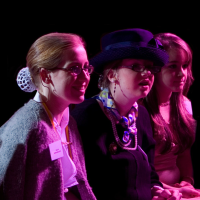 Riddlesbrood Touring Murder Mystery Company has been producing top quality murder mystery entertainment for over 17 years and performed at over 1,500 shows and private parties! Murder Mystery themes for private events include Sherlock Holmes Murder Mystery, The Roaring Funnies, C.S.I Crime Scene Idiots, The Game Show, Shiver Me Timbers, Medieval Madness, Houdini Whodunnit, Harken – The Game of Phones, A Christmas Carol and Franken-Murder. Custom show themes are available as well, call to discuss your ideas and Riddlesbrood Touring Murder Mystery Company will put together a spectacular show! Call to book today! Mystery Theater Productions that will Come to You in NY! You can have a customized interactive murder mystery party in NY for your kid's next birthday with Funny Bonz Entertainment! The entertainment team will obtain prior knowledge of each guest and then write a custom script for your party with three to six performers. 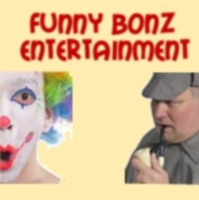 Everyone becomes a suspect at Funny Bonz! Choose between four different NY murder mystery party themes: Hollywood's elite, rock star, athlete/Olympian, and superstar search. The kids will have a blast! If your son or daughter has a birthday coming up, then throw him or her an adventure mystery party in NY at Legendary Entertainment! The party will be a blast from start to finish with a character and party motivator, music, interactive dances, games, and a mystery treasure hunt. The kids will be led on an adventure to find clues to a hidden treasure. This interactive mystery party in NY is fun for kids of all ages, so book your party now! A Variety of Mystery Party Themes in NY! Great for kids age four and up, Mystery and Mayhem offers fun-filled murder mystery kids parties in NY. You can choose between an array of different kid's party themes, including magic shows, fortune telling parties, mystery and mayhem parties, pirate treasure hunt parties, and much more. 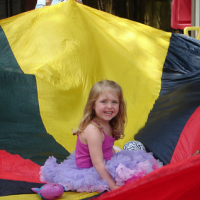 Each party is unique and interactive so the children will have a fun and exciting time! 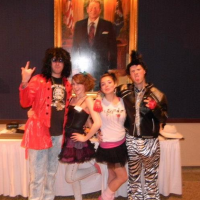 Start planning your kid's NY murder mystery party with Mystery & Mayhem today! They Handle the Party Planning in NY! Choose from a variety of mystery party themes in NY that are specialized for each age at The Murder Mystery Company. Kid-friendly shows are available with the NY murder mystery flare, but without the "murder." They will provide a two-hour interactive game that involves costumes and characters for each kid in the party. The children will have a blast going on a scavenger hunt and solving a mystery. The Murder Mystery Company team will handle everything, from set-up to clean-up, so the parents can sit back and enjoy the show. Request a Customized Kid-Friendly Mystery Party in NY! With a professional cast made up of Broadway, TV and film actors, you just can't go wrong with The Killing Kompany. Choose to either go to one of their fine restaurants for a public murder mystery dinner shower in NY, or host a private NY murder mystery party in your own home! The actors will disguise themselves in the restaurant, and then get everyone involved in the murder mystery. You can also request a customized kid-friendly party for the little ones with no "stage deaths" involved, but still the same amount of mysterious excitement. Interactive Murder Mysteries in NY! Book an NY murder mystery party with NY Dinner Theater. You can either come to one of their many New York locations, or have them come to you for your kid's murder mystery party in NY. Their shows include a DJ and dancing, along with and interactive murder mystery plot. 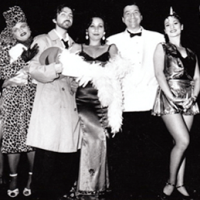 Whether you have 10 guests or 2,000, NY Dinner Theater will accommodate for you. Choose between a variety of fun party themes, including The Soprano's, "Let's Kill the Boss" and "Killing Mr. Withers." Kiddie Mystery Themes in NY! Serving the New York area, Mostly Murder is the perfect company for your kid's murder mystery party in NY. Offering a variety of kid-friendly mystery themes, Mostly Murder will entertain your party from start to finish. Choose the 'star search' or 'a clue mystery' for some kiddie mystery fun! The Mostly Murder actors will make some of the party guests suspects in the murder or theft, and get everyone involved in the murder mystery plot! The fun and excitement is endless with Mostly Murder.